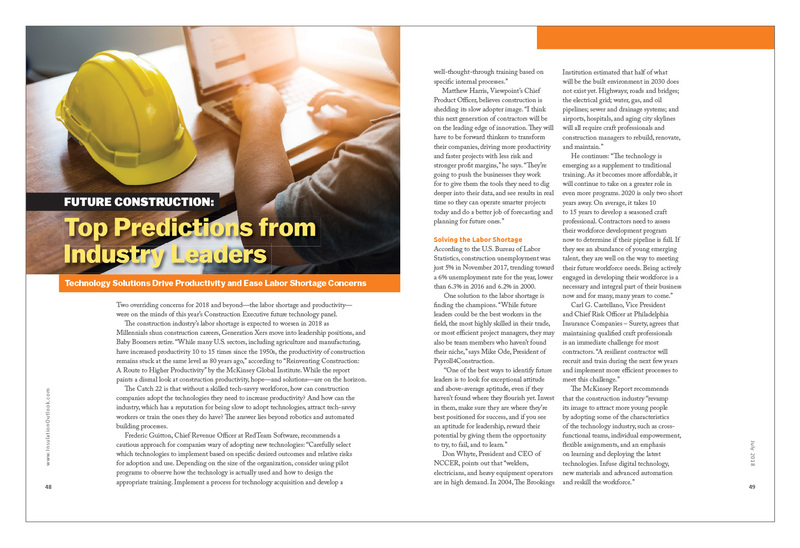 Two overriding concerns for 2018 and beyond—the labor shortage and productivity—were on the minds of this year’s Construction Executive future technology panel. The construction industry’s labor shortage is expected to worsen in 2018 as Millennials shun construction careers, Generation Xers move into leadership positions, and Baby Boomers retire. “While many U.S. sectors, including agriculture and manufacturing, have increased productivity 10 to 15 times since the 1950s, the productivity of construction remains stuck at the same level as 80 years ago,” according to “Reinventing Construction: A Route to Higher Productivity” by the McKinsey Global Institute. While the report paints a dismal look at construction productivity, hope—and solutions—are on the horizon. The Catch 22 is that without a skilled tech-savvy workforce, how can construction companies adopt the technologies they need to increase productivity? And how can the industry, which has a reputation for being slow to adopt technologies, attract tech-savvy workers or train the ones they do have? The answer lies beyond robotics and automated building processes. According to the U.S. Bureau of Labor Statistics, construction unemployment was just 5% in November 2017, trending toward a 6% unemployment rate for the year, lower than 6.3% in 2016 and 6.2% in 2000. One solution to the labor shortage is finding the champions. “While future leaders could be the best workers in the field, the most highly skilled in their trade, or most efficient project managers, they may also be team members who haven’t found their niche,” says Mike Ode, President of Payroll4Construction. The McKinsey Report identified insufficiently skilled labor at the frontline and supervisory levels along with industry underinvestment in digitization, innovation, and capital as one of 10 root causes of productivity failure. By comparison, the JBKnowledge 2017 Construction Technology Report found that lack of staff to support the technology, insufficient budgets, and employee hesitance were the top 3 reasons for not adopting new technology. The Internet of Things (IoT) and advanced analytics. The technology exists for seamless interaction among all stakeholders on a project as they view a 3-D hologram of the project’s design, enabling everyone to visualize, share ideas, and detect problems on projects. Augmented reality (AR) and virtual reality (VR) are methods of viewing data, but artificial intelligence (AI) is the key to understanding the data,” says Sarah Hodges, Director of Autodesk’s construction business line. “Successful companies won’t simply capture and store the data, but develop capabilities to centralize the data, normalize it, and analyze it. As construction technology providers continue to offer more integrated solutions, contractors will collaborate with all project stakeholders to design and build cohesive infrastructure, utilities, buildings, and communication networks in smart cities. For now, contractors are using apps on mobile devices for time tracking, generating reports, managing documents and inventory, and documenting project progress, which leads to more integration, collaboration, and communication. With the number of applications and technology available, it is important that all data and information flow freely between all applications and users, Rogers adds. “Integration and an open platform for collaboration and transparency can connect all members of the project team more closely than ever before—from the owner and architect to the general contractor and subcontractors,” she says. “Disjointed interests among stakeholders is a big problem. A crucial consideration when assessing whether a company is positioned for growth is IT’s role in the business. Contractors must ensure a seamless workflow to connect their back office, extended project team and field staff. “Going forward, I think the companies that will thrive and grow, regardless of economic cycles, are the ones that make the IT investments today that will allow them to scale tomorrow,” Harris says. Drones are becoming more commonplace on the construction jobsite as they become adept at capturing aerial data and jobsite data in 3-D models, and produce high-resolution images. Despite these improvements, drones may soon be replaced by real-time satellite images with zoom resolution and overlays. While Ryan Driscoll, Marketing Director at GPS Insight, agrees that driverless cars are the future, he doesn’t see autonomous vehicles overtaking the construction space just yet. Driverless vehicles, however, “would improve driver and public safety and result in more efficiently driven vehicles. Mobile apps are going to be the vehicle that construction managers use most to consume telematics information, especially as Millennials and Generation Z enter management positions,” Driscoll says. By incorporating the IoT, construction equipment, materials, and even structures can communicate with a central data platform to capture critical information, such as equipment usage and performance along with other real-time data that enables contractors to streamline their supply chains, reconcile material plans with physical availability, and analyze productivity. On the wearables front, the IoT is being applied in a variety of interesting ways. According to Weiss, the correlation between health and safety means both must be considered to keep people on jobsites safe, but ultimately the information gathered by the wearable needs to be used in some way by putting it back into other systems and platforms. “As it’s automated, it can be integrated into what has to be managed for safety records,” he says. In addition, next-generation wireless connectivity (5G) will enable the transfer of gigabits of data in seconds to make it even easier to collect data from connected construction tools, equipment, wearables, sensors, drones and vehicles, and to leverage the IoT on jobsites to improve productivity and safety. Michael B. Bomba, Director and Counsel for AIA Contract Documents, cautions, “With the increased dependency on digital practice techniques, including electronic project management systems and BIM technology, the construction industry is far more exposed to cybersecurity risks than it has been in the past. Insurance companies have reported a significant rise in the ransomware occurrences where a company’s computers have downloaded malicious software that is designed to block the company’s access to its data until a ransom is paid. Accordingly, the company is exposed to the amount of the ransom, as well as the possibility of significant business interruption costs. Reprinted from Construction Executive, January/February 2018, a publication of Associated Builders and Contractors. Copyright 2018. All rights reserved. This article was published in the July 2018 issue of Insulation Outlook magazine. Copyright © 2018 National Insulation Association. All rights reserved. The contents of this website and Insulation Outlook magazine may not be reproduced in any means, in whole or in part, without the prior written permission of the publisher and NIA. Any unauthorized duplication is strictly prohibited and would violate NIA’s copyright and may violate other copyright agreements that NIA has with authors and partners. Contact publisher@insulation.org to reprint or reproduce this content.